Cleaning up plastic waste in the world’s oceans. Sounds odd, right? Well, it’s what Andrew Turton and Pete Ceglinski are dedicating their lives to – and Kwik Sweep, London’s favourite waste removal and collection company, is about to tell you more about it. The two are the creators of Seabin, a ‘rubbish bin for the ocean,’ as they like to describe their invention. Seabin is simple. It is a floating device that used the ‘up and down’ movement of ties to collect floating rubbish. Thanks to its submersible water pump – which is capable of displacing up to 25,000 litres of water per hour) – water is sucked in from the surface, trapping debris and plastic waste in an internal bag that can hold 20kg of waste. Turton and Ceglinski estimate that each Seabin can trap up to 1.5kg of waste a day – and only need to be emptied once a month. Seabin is a revolutionary device. It is able of extracting microplastics as thin as 2mm from ocean water – and its creators are working on making it even more efficient. The duo is determined to do more than just using Seabins to clean up oceans. They want to change the way we think about our waste, too. ‘We need technological solution, but it would be good to not need them. The real solution is not the technology, but us being more responsible with how we purchase, reuse, and recycle,’ said Ceglinski in a recent interview. The road to success is long. 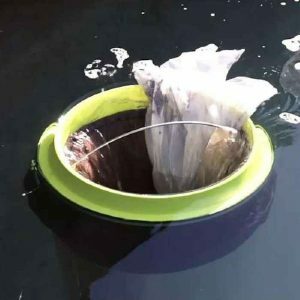 Yet, the duo has already succeeded where others have failed: their project has captured the attention of the European, Asian, and American markets – meaning that we may soon see Seabins all over the world. The Seabin project is, in many ways, similar to Kwik Sweep. We, just like Sabin, are committed to making the world a greener place. So, if you find yourself in need of help, whether that involves plastic, hazardous, or food waste, get in touch with us. Kwik Sweep is ready to help.